It’s always difficult to photograph a funeral and this past Saturday’s for 14-year-old Amaria (affectionately known as Momo) was no different. In addition, this was also the first funeral that I’ve had to attend since my mother’s passing, which fished out some uncomfortable emotion. So, as usual, the media stayed back and gave the family their deserved space. We had a clear view of the church’s front door until it began to snow and rain at an incredible rate. When I looked through the camera, I couldn’t make out a person standing 6o metres away. As people started pouring out of the church, I tried to manual focus through the snow, which wasn’t working until I could faintly make out someone holding flowers. The bouquet gave me something to track and I managed to shoot only four sharp frames of what turned out to be Crystal Diljohn, Amaria’s mother. When this is all said and done, I hope the picture helps viewers better empathize with the incredible sadness that this mother must be feeling. At least I hope that’s why I’m there documenting such tragedy. 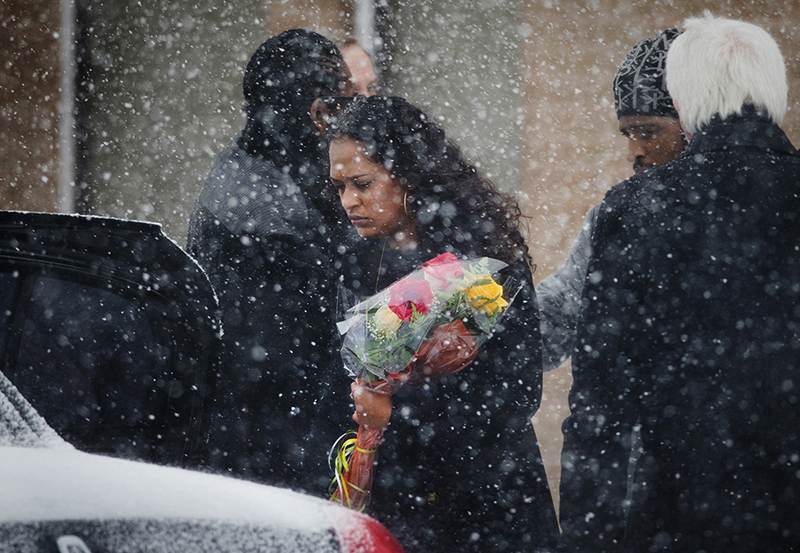 Crystal Diljohn carries flowers while being helped into a car following the funeral service for her 14-year-old daughter Amaria Diljohn at the Malvern Christian Assembly in Toronto on Saturday, January 3, 2015. A TTC bus fatally struck the 14-year-old last week and the driver failed to stay at the scene.